Sometimes it’s good to just put the paddle down and let the canoe glide. It feels like i have been paddling a lot lately. Not literally, but figuratively speaking. From Alaska to the Mexican border, to the Canadian Rockies, a short week back to Alaska, and the Pacific Northwest by bike, ferry, plane, and car. Time to put down the paddle, for a while. I look forward to some downtime that involves cooking great meals, baking bread and pastries, siting in front of a crackling fire place, and inhale some crisp mountain air. Or is that already too much paddling? Moving to a new place means to trade the familiar with the unfamiliar. It means leaving friends behind and meeting perfect strangers. The comfort zone becomes less comfortable. Moving also brings excitement, new opportunities, and change, which must have a lot weight in my case, otherwise I would not lead such a nomadic life. After living three years in Alaska I am heading South. Not that I couldn’t stand the mosquitoes in the summer or the cold and the isolation in the winter. To the contrary, I liked the serene life style and the harsh weather during the winter months up North. Life may not be easy during the dark season, but it is simple. It takes work to stay alive. Everything takes more effort: going places, fixing things in and around the house. Those efforts made me a appreciate life. So why leave? For me it’s like watching a movie more than once. I may understand the movie better after the second time and find a few new details the third time around, but in general I got the big picture. So, I am going to see a new movie next time. In the meantime I keep wandering. 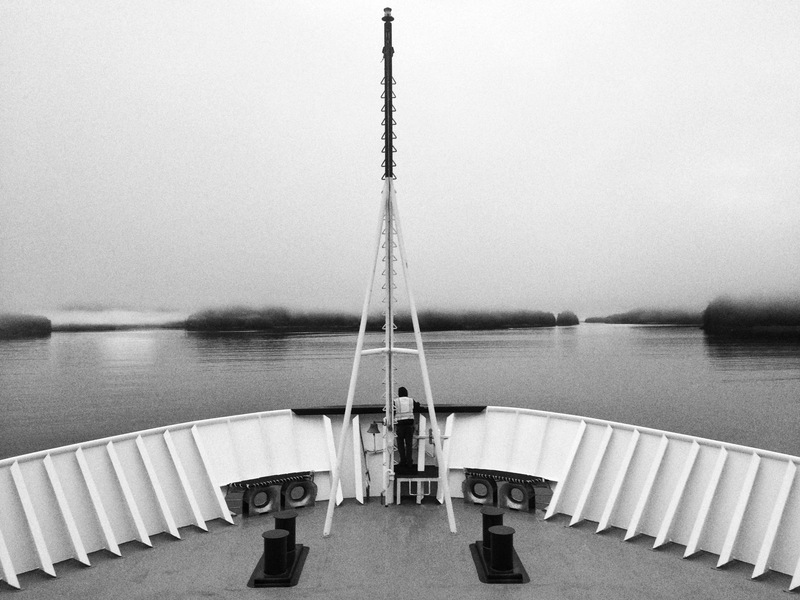 Alaska bid a magnificent farewell with a misty Inside Passage and glowing Northern Lights. An uncharacteristic week of calm has just been upon us. The calm before the storm? At night the temperatures dropped below freezing leaving frost on the grass in the morning. The water was smooth as a mirror. Some residents are busy arranging their departure. Who stays? Who will spend the winter? That’s one of the topics around here. It will become even more quiet when the last snowbird has left. There are two ways to look at this. Winter comes with a sense of peace and calm. You could also say it brings solitude and isolation. I guess it is up to me to decide, which side to pick. In short, I think I am checking out, as in disconnect, unplug. Seeking peace and quiet in my little paradise. Those are the words of John Muir, who was a loud and clear voice in the creation of the national park system in the United States. His travels in and writings about the wilderness of North America had an influence on many, including Theodore Roosevelt. Interestingly, John Muir was opposed to the government running the national park system, as he considered many politicians as being incompetent, to put it politely. He wanted the US Army to run the park system. John Muir died 2 years before the National Park Service was instituted by Congress in 1916. Today we celebrate the 100th birthday of the National Park Service. My feelings about the national parks are ambivalent. The idea to preserve wilderness and history for future generations is commendable. However, what we consider wilderness and how we access and manage wilderness is contentious. I am with Edward Abbey, who suggested parks with limited access by automobile. I know this is not a very popular proposition, but it is the only way to experience real wilderness, as described by John Muir. Thanks to their remoteness, size, and administration some parks in Alaska come very close to John Muir’s idea. Access to Denali, Wrangell-St.Elias, Glacier Bay, and other parks in the state is limited due to their remote location and their sheer size. Those are the places that appeal to me. In the 80’s I spent many days and nights in Yosemite Valley. Above the valley floor it is strikingly beautiful, but I never understood, why we had 1-hour film processing and other unnecessary amenities in the valley. There was a time when private traffic was banned in the valley, which I thought was a great idea. Today, up to 21,000 visitors find their way into the valley on a peak day! Campsites are hard to get without advance reservation. The Park Service has the difficult task to balance conservation and visitation. In 1917 there were 11,000 visitors in the park all year! I think it is worthwhile, especially on a day like this, to reflect on our views of wilderness and conservation. Do we really need to drive our vehicles into parks and expect to see wildlife and pristine landscapes from the comfort of our cars? It is not available on demand. It is an experience that you cannot buy. Without it our planet is a cold, dead place. Dense fog lingered yesterday in the Upper Lynn Canal grounding the local helicopter fleet. Usually they shuttle visitors onto a nearby glacier, so they can experience the magic of walking on ice or riding in a dogsled. Obviously I am on a different schedule and I would rather spend a winter with the dogs or go on a long hike to experience the beauty of remote ice fields, but not everybody has the opportunity to do so. Nevertheless, I can’t help the thought that the best way to connect with Nature is to be in Nature. Taking the helicopter feels like a thrilling shortcut to me. Seems to me taking shortcuts is a virtue of our times. Who is teaching us about humanity, one of the seven virtues? One benefit of age is that you can look back, not to regret, just to reminisce. There were obstacles, detours, and dead ends. Did it matter? Not really. Life went on. I hope that our future leaders choose paths of morality and ethics, not short term gains and fame.